It’s been a weird week. L has been on vacation with J’s parents all week, so it’s just been three of us at home. We’ve been pretty bad about making meals and have eaten out more than we usually do. Thursday night I texted J asking if she wanted to go out for dinner. I was in the mood for BBQ and Arcadia just sounded good to me. She wasn’t in the mood for going out so I picked up Qdoba instead. I tried again on Friday night and this time J was up to going out. Since it was Friday night and neither of us had to work the next day, I suggested we go someplace we wouldn’t normally go. We used to travel around the region all the time on weekends before we had kids and since we only had the one, why not take a little road trip? I still wanted BBQ and there is a place I’ve been driving by in Bangor that keeps grabbing my attention. It’s a little far for dinner for us, but J had no objections so we headed towards the lake on M-43. 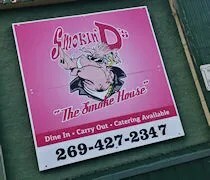 Smokin D’s The Smoke House is in downtown Bangor right on the corner of Monroe Street (M-43) and Railroad Street. 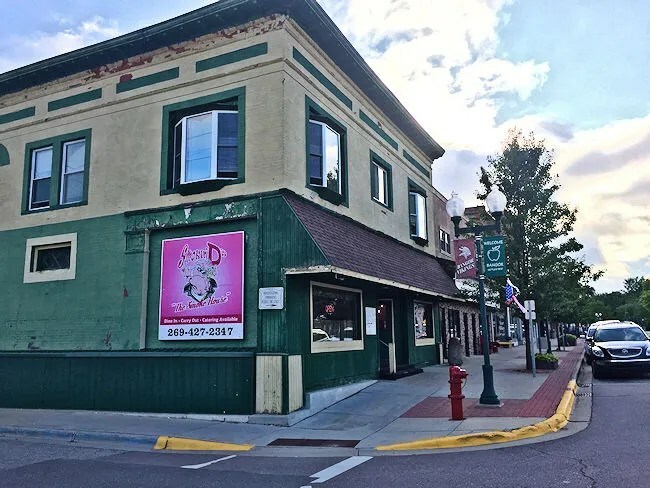 The restaurant is in an old mixed use building that has served as a restaurant for many years in the downtown business district. The last restaurant I could find that used the space was Mimi’s Pancake House & Restaurant. Parking is mostly street parking with municipal lots nearby. We found a spot on Railroad Street right next to the tracks and walked across the street to the front door. The front of the building looks like it used to be two seperate businesses at one time, but just looking at Google Maps photos, it’s all been used as one big space for quite a while. The diner that took the space before used both sides as a dining room and while the second space was closed off, it looks like Smokin D’s either does or plans on doing the same. The entrance to the space is a small waiting room with a cash register and hostess stand. 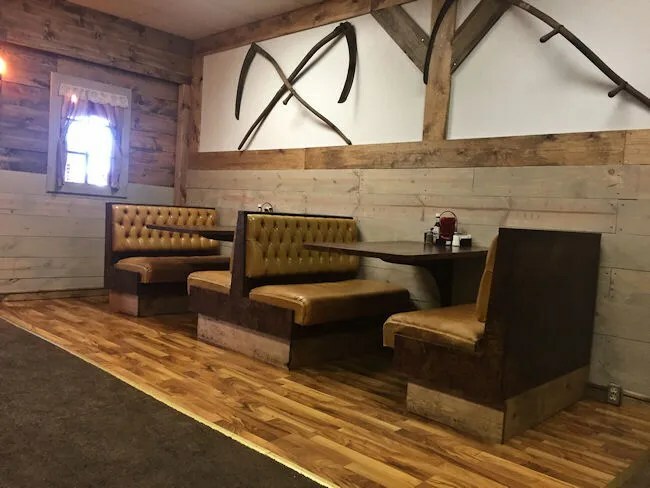 Right away the space takes on the field of a classic country roadhouse with wood laminate flooring and wood slat walls reminiscent of a rustic cabin. The lone waitress saw us walk in and told to to grab a seat wherever we’d like There were only two other couples eating dinner at 7:30 on Friday night. We walked to about the middle of the dining room and grabbed one of the booths along the wall. 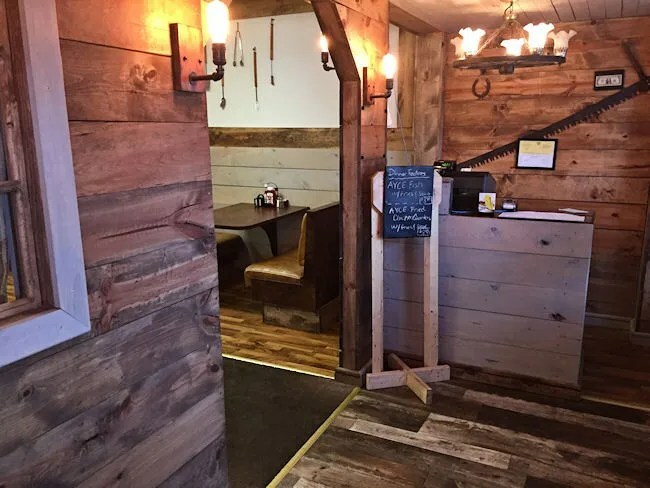 The cabin theme is continued in the dining room with wood plank paneling and antique harvesting tools hanging on the walls. The booths look like they have been around for a while and could have been re purposed from the buildings previous life, but the larger family tables are definitely new to this space. 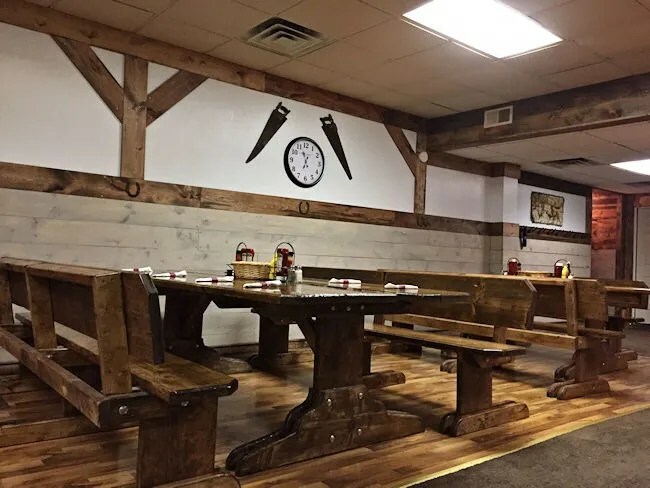 These large, solid picnic table style seating areas add a really distinct look to the the back end of the dining room. The dining room was really quiet almost to the point it was uncomfortable. It’s nice to be able to have a conversation while eating, but it also felt like we had to be quiet not to disturb anyone else. B can be loud at times and every time he screeched, we looked around to make sure we weren’t annoying anyone else. It was a slow night probably because it was so nice out, but it was a little unnerving that we felt like we would be bothering others if we talked too loud. The waitress grabbed a couple of menus and came over to ask us about drinks. They don’t serve any kind of alcohol so J got a sweet tea while I stuck to Pepsi. She also brought a Styrofoam cup with a lid full of water for B. One of those things on the dinner menu was the Slaw-B-Q. It didn’t do much for me, but J decided to go for it. 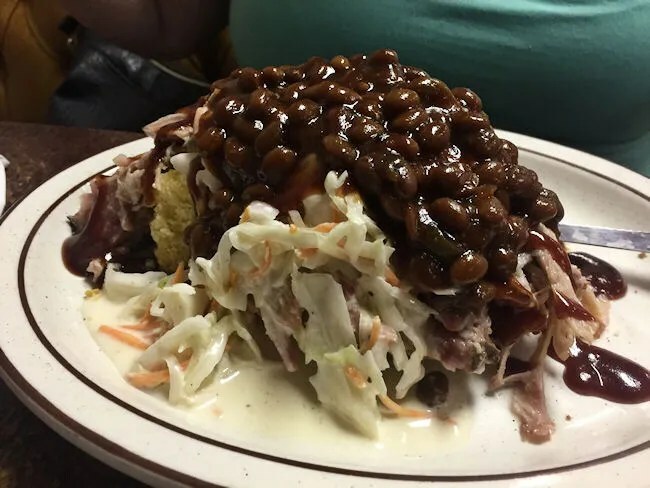 The Slaw-B-Q is home made cornbread topped with pulled pork topped with slaw topped with beans. Picture Thanksgiving with your grandma who just mixes everything together on her plate, but this actually tastes good. The plate is probably big enough for two people as the bottom layer of corner bread is quite tall. The pulled pork seems to be Smokin D’s signature and it was quite delicious. It was tender, juicy, and tasted like there was just a little bit of BBQ sauce clinging to the smoked meat. J said the beans were amazing. I don’t like baked beans so I didn’t try them, but she said she was surprised at how good these beans were on their own. She really liked the creation as a whole but only ate about half of it. Near the end she picked around to make sure to pick up all that delicious pork that was hiding under the pile of sides. I started scouring the menu looking for the brisket. I found it on the “Dinner” section and it turns out, it’s the most expensive thing there. I found that a little shocking considering they have whole racks of ribs. I hesitated for a second and decided to just go for it. 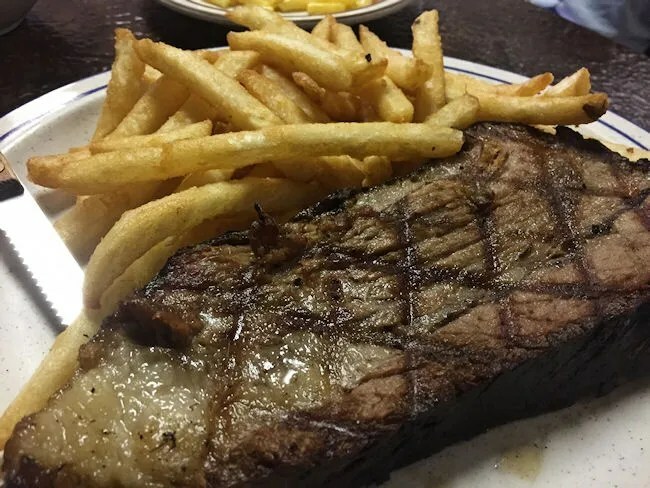 The brisket comes served more like a steak than BBQ. They take a 16 oz. portion of the brisket and cut it about an inch thick. After it’s smoked, it’s finished off on the grill to give the checkered grill marks. I didn’t really know how to tackle the brisket like this. I started trying to cut it but it was kind of shredding with the knife so then I just started pulling it apart. The brisket, in parts, was very tender and very juicy, but other parts got a little tough. I really like the Texas style brisket with a very salty crust. This brisket didn’t have that, but there was a little bit of a salt and pepper flavor around the edges. Knowing the price of the plate as well as how it’s served, I probably wouldn’t order this again. It was tasty and I still enjoyed every bite, but the preparation isn’t really something I was too wild about. I would be more willing order a smaller portion so I’m not spending as much on my meal as I could on both of ours. The menu on their Facebook page shows a Brisket sandwich…I don’t remember seeing that. If I missed it, that’s my bad…I’d be much more willing and eager to do that in the future. The brisket is a dinner so it comes with two sides. 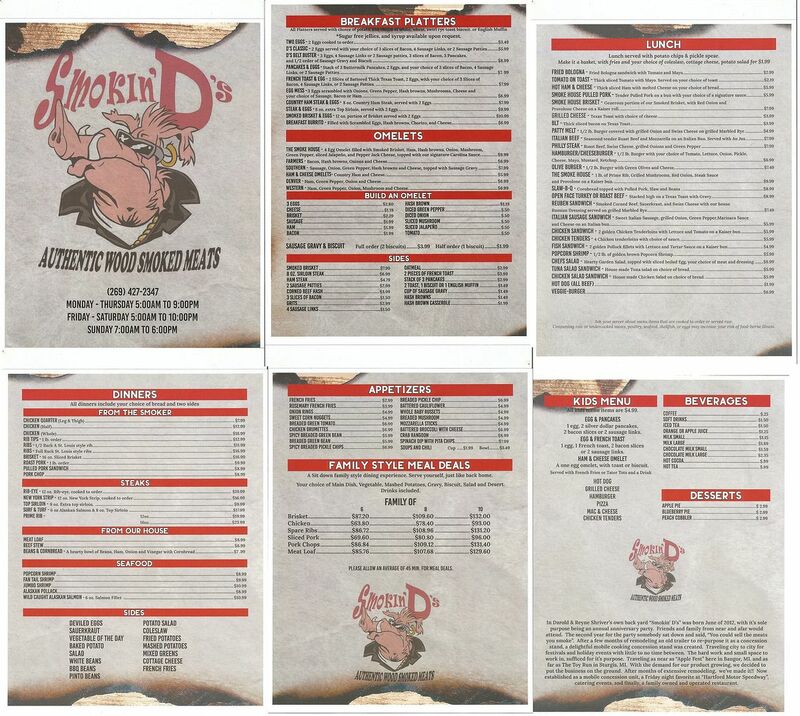 They have a lot of the usual BBQ place sides and some unusual ones too. I did a normal one and one that surprised even J. 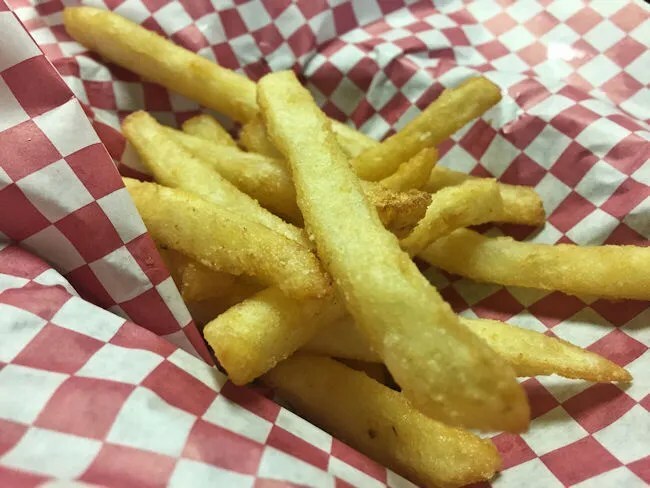 The French Fries was my normal pick. They were out of the bag battered fry. They were good on their own but even better for picking up some of the leftover juice from the brisket that remained on my plate. B also got these as the side for his meal. The unusual side I picked was Deviled Eggs. The preparation is simple family picnic style, but Deviled Eggs aren’t something I get much anymore so I appreciated that simplicity. For whatever reason, hard boiled eggs are the only food that I can stand to eat with mayonnaise. I hate mayo….except when I’m eating it with hard boiled eggs. It’s another one of those things that goes back to my childhood. 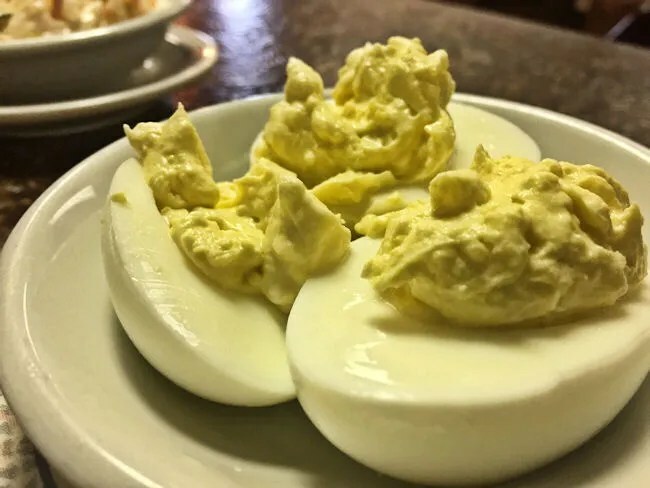 Deviled Eggs are about the only thing one of my aunts could make for family get-togethers (cooking is not her strong suit) so I ate them a lot and still really like them to this day. We let B try to pick his own meal and he just kept yelling “cheese!” over and over so that’s what he got for dinner. He did have the choice between grilled cheese or Mac ‘n Cheese and he chose the pasta. 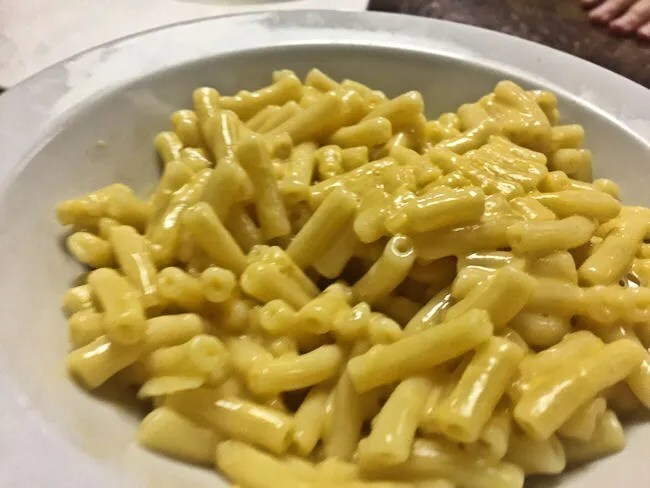 The small bowl is just Kraft Mac ‘n Cheese, but that’s always a welcome thing when we see Mac ‘n Cheese on a kid’s menu. He was being a little difficult at first, but eventually ate most of the bowl before the waitress brought us our check. Our bill for the three of us was about $40. There’s no alcohol in that price, but, as I mentioned early, my meal was almost $20 by itself.